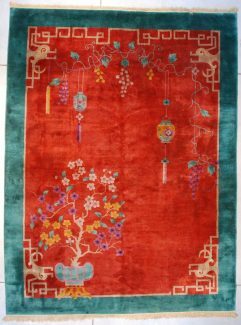 This antique Art Deco Chinese Oriental Rug measures 8’10” X 11’6” (272 x 353 cm). It has an overall Deco motif on a deep purple field with butterflies and a large bird on a branch with a cockscomb and blue and green feathers and a rose colored body. 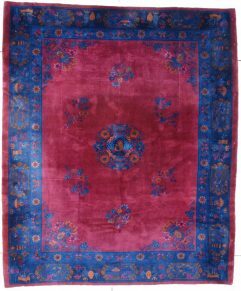 There are three other floral motifs in the field consisting of flowers in blue, blue/green and brown with red centers. There is a beautifully drawn lantern suspended from a branch coming from the top right border. 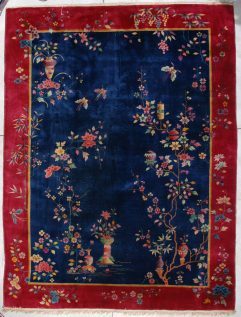 There is a wavy brown ribbon at the bottom of the rug and two beautiful butterflies at the lower left corner. 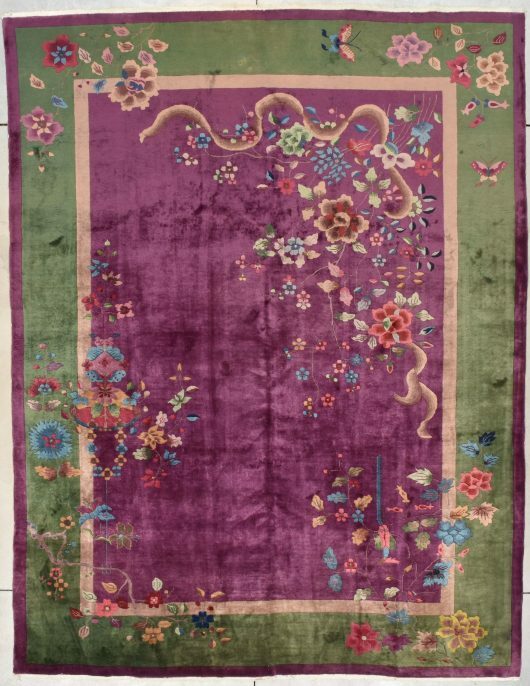 The purple field is surrounded with a deep olive green border. The rug is essentially full pile and the wool is of the highest quality. The ends and sides are complete. It is clean and ready to go. The buyer pays the shipping which includes insurance of $150.00. 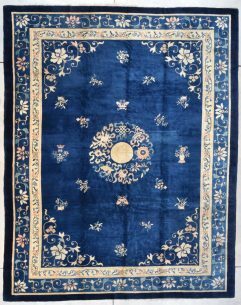 This rug is stunning and will definitely make any room in which it is laid!